This is probably not Audi’s next Tesla rival. But it looks so good that it simply must be shared with you, the reader, so that you may join me in wishing it into reality. It looks like it came out of a German car magazine. (I don’t know exactly which one, since it’s been a hot minute since I’ve bought a copy of Auto Motor und Sport and I no longer recognize the font.) Given that it’s a car magazine it looks like it’s just a speculative render, not unlike the McLaren rendering that Autocar pushed to the public the other week. 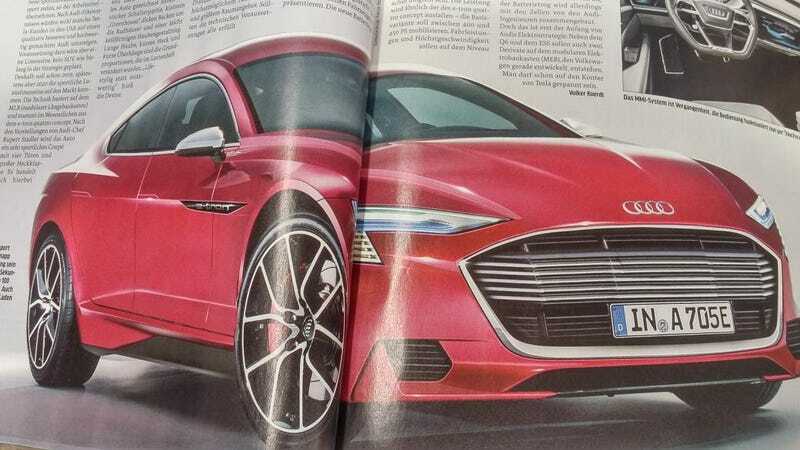 If I had to guess, the rendering is based on maybe an existing Tesla Model S, or perhaps an Aston Martin Rapide. But the idea that this could be a rear- or all-wheel-drive car is interesting. It’s entirely possible that this could be something of an electric version of the new Porsche Panamera, or you could think of it as an Audi version of the electrified Panamera that Porsche itself is building, a car previewd as the Mission E concept. All share the same new Volkswagen group MSB platform. But we really don’t know. All I can say is that it’s gorgeous and I wish it was real.